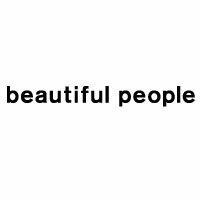 beautiful people (ビューティフル ピープル) is a brand of entertainment Ltd. It was launched in 2007 by designer Hidenori Kumakiri. Born in Atsugi, Kanagawa Prefecture, Kumakiri studied at the Fashion Technology Department of Bunka Fashion College before joining Comme des Garçons Homme as a patterner. Kumakiri was born into the fashion business. His parents were in the knitting business, but he didn’t show much interest in working with fashion until he failed his entrance exams for college. Thinking he would fail again, his mother brought him an application brochure for Bunka Fashion College. beautiful people’s debut collection mixed haute-couture with casual and showed Kumakiri’s ability to bring together extremes in a balanced manner. It featured military items using 100% silk chiffon fabric, and “vintage denim” with details replaced by embroidery. This mixture of haute-couture and casual still sets the tone for the brand today.